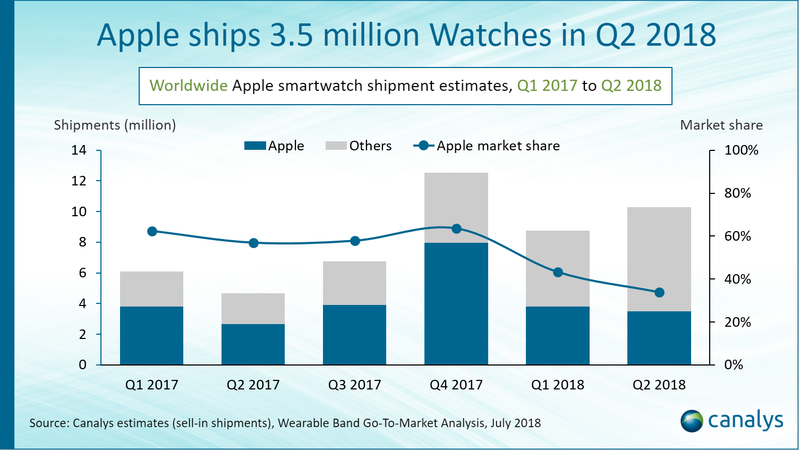 Palo Alto, Shanghai, Singapore and Reading (UK) – Thursday, July 26 2018: Apple’s smartwatch performed strongly in Q2 2018, with 3.5 million shipped worldwide, 30% more than in the same period last year. Overall, global smartwatch shipments reached 10 million units on the back of stellar performances by, among others, Fitbit and Garmin, as vendors capitalized on the wearables trend and diversified their portfolios to target distinct customer segments. As a result, Apple’s share of the smartwatch market fell to 34% from 43% in Q1 2018. Apple Watch shipments to Asia (excluding China) surpassed 250,000 units, with the LTE version accounting for about 60%. The cellular-connected Apple Watch Series 3 was the best-shipping smartwatch in Asia in Q2 2018.